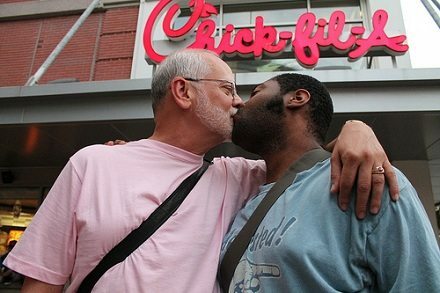 The Civil Rights Agenda, an advocacy group dedicated to LGBT issues has released a statement announcing that Chick-fil-A has agreed to cease its funding of groups opposing gay marriage. Last summer the company ran into a firestorm of protest against its funding of those groups as well as the public statements against gay marriage made by a company spokesperson. The protests were online and offline and included a “kiss-in” at the shops. It also drew in elected officials in Boston and Chicago who vowed to block the company’s expansion plans. On the other side, former Arkansas Governor Mike Huckabee organized fans of the company’s position to take to the streets waiting in long lines to purchase a sandwich in support of their anti-gay position, or their right to hold an anti-gay position.